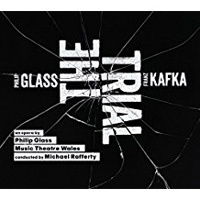 PHILIP GLASS (b.1937): The Trial. Description: Glass' 26th operatic work is a remarkably successful piece of music theatre; a 'pocket opera' in the composer's terminology, with a small cast and a chamber orchestra. This category of Glass' output excels in clear, uncluttered storytelling and narrative forward motion. The music is still very recognisably by Glass - the chord sequences and harmonies are familiar, as are the pulsing rhythms and oscillating intervals and arpeggii, and the emphasis on repetition, but the idiom is barely 'minimalist' in the process-music sense of the term. Melody, in a conventional sense, and more persistent dissonance, are important features of this recent idiom. This style is ideally suited to the telling of Kafka's disturbing, pitch-dark comedy of dream-like illogic and senseless bureaucracy. The obsessively ticking obstinacy of the music, softly sinister and melancholy, precisely matches the hopelessly dogged attitude of the protagonist, Joseph K., as he attempts to navigate the labyrinth of the trial, even as the surreal legal proceedings against him persistently infiltrate every aspect of his mundane existence. Christopher Hampton's libretto streamlines the story and Glass' music provides a vehicle to move it forward with irresistible momentum. Libretto included. Music Theatre Wales; Michael Rafferty.